Residents of a Forest Park neighborhood in Springfield woke up Monday morning to a fallen tree. The tree smashed into a 1993 Honda Civic, a house at 23 Vermont Street, and took down city wires. The house on Vermont Street will be reviewed by inspectors of the Department of Code Enforcement for habitability. Falling tree accidents cause hundreds of fatalities each year in this country, and far more than that in injuries. Injuries suffered from a falling tree can result in litigation against the property owner in certain situations. The owner of the tree or land on which the tree stood, had a duty to maintain the land and tree in a safe condition. A victim of a falling tree can sue a landowner if it can be shown that the victim was welcomed on the property by the landowner and if the landowner had reason to believe that harm was possible from its tree falling. Sometimes a tree that causes injury is on city property, and the victim will have to fight the city for redress of injuries. This is especially possible if the tree itself, or the conditions supporting the tree, were not safe in some manner. Liability exists where it can be shown that the condition of the tree put the government on notice that it was a danger to homes or pedestrians. If the government knew this, and had enough time to make the tree and surrounding area safe, and did not do so, then a Massachusetts personal injury attorney has cause to file suit. 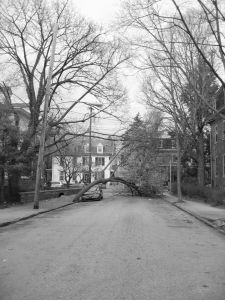 If you have suffered injuries due to a falling tree in your neighborhood call the attorneys at the Law Offices of Jeffrey S. Glassman at (617) 367-2900.